OXFORD, Miss. 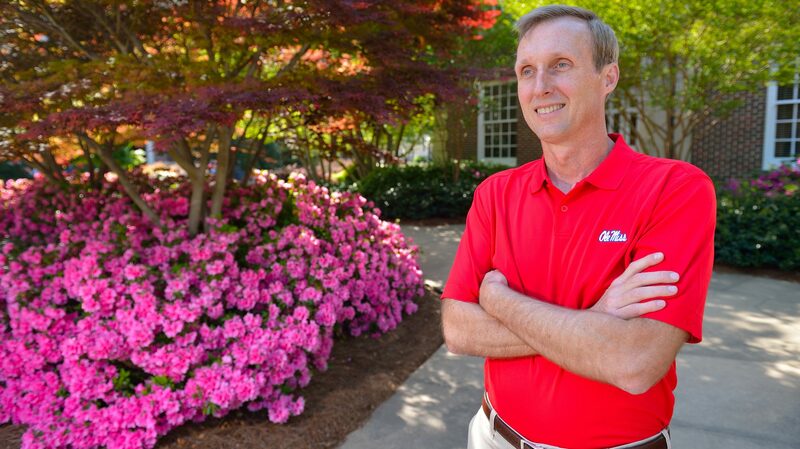 – Jeff McManus has drawn widespread acclaim for his efforts to keep the University of Mississippi campus looking gorgeous – the most recent of which was being elected president of the Professional Grounds Management Society for 2019. McManus, director of landscape services, airport operations and golf course operations at Ole Miss, will serve a one-year term, while continuing in his role with the university. The PGMS was established in 1911 as a professional society focused on education and professional advancement, and McManus said these objectives will be central to his tenure at the head of the group. “The primary focus is going to be on leadership on empowering people in landscaping to become leaders with or without titles,” McManus said. “The role of landscaping plays an impactful role in so many ways: recruiting, safety, outdoor therapy, to name just a few. Chancellor Emeritus Robert Khayat hired McManus in 2000 following a national search to find the best landscape manager in the business to turn UM into a five-star property. McManus had made a name for himself after leading landscape efforts at two large resorts in Florida: Grand Cypress Resort in Orlando and Turnberry Isle Resort and Club in North Miami. McManus “changed the landscape culture and the general culture in the local community of Oxford, Mississippi, in a very positive way,” Khayat said. McManus challenged his staff to develop the best-landscaped campus in the country and got them new uniforms and equipment to make their jobs easier. He oversees more than 1,500 acres, including the Ole Miss Golf Course. His beautification efforts have been recognized nationally five times during his tenure, including being named Most Beautiful Campus by the Princeton Review, Professional Grounds Management Society and Newsweek. McManus is the author of “Growing Weeders into Leaders” (Morgan James Publishing, 2017), a tome on leadership, and “Pruning Like A Pro” (CreateSpace Independent Publishing Platform, 2015), a how-to guide. He has previously won the PGMS President’s Award and was named the Auburn University Department of Horticulture’s outstanding alumnus for 2016. Larry Sparks, UM vice chancellor for administration and finance, said no one deserves the opportunity to lead the PGMS more than McManus does.